Remember that song "Popcorn" that hailed from the late disco era? Here's a pretty funny Muppets skit called "Popcorn." My kids love it. How much do I love the Swedish Chef! Big Muppet fans, here. "I am not a shrimp; I am a King PRAWN!!" 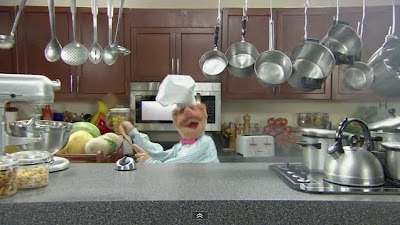 Jeff, don't feel bad, I am almost 66 and can still do both the Sveedish chef AND the Count! That was a hoot! I called my three kids over to watch on my laptop and they just about bust a gut they were laughing so hard.